Moral courage is the much-needed bodyguard of conscience and character. The temptations and pressures to sacrifice integrity are numerous and powerful. We should be able to overcome the temptations and resist the pressures by sheer self-interested logic. After all, without our integrity we will find our souls on the auction block over and over. Moral courage allows us to do the right thing even when it costs more than we want to pay and we need it to stop us at the very beginning of the slippery slope of moral compromise. But unswerving integrity can also be intimidating. Improper requests deserve an immediate, firm, and dignified response that leaves no ambiguity that they’re inappropriate. Be careful not to be self-righteous, though. Let the person who asked you to do the wrong thing worry about what you think of them. If he or she persists, let them – not you – worry about the consequences. Integrity is power. Integrity is intimidating. 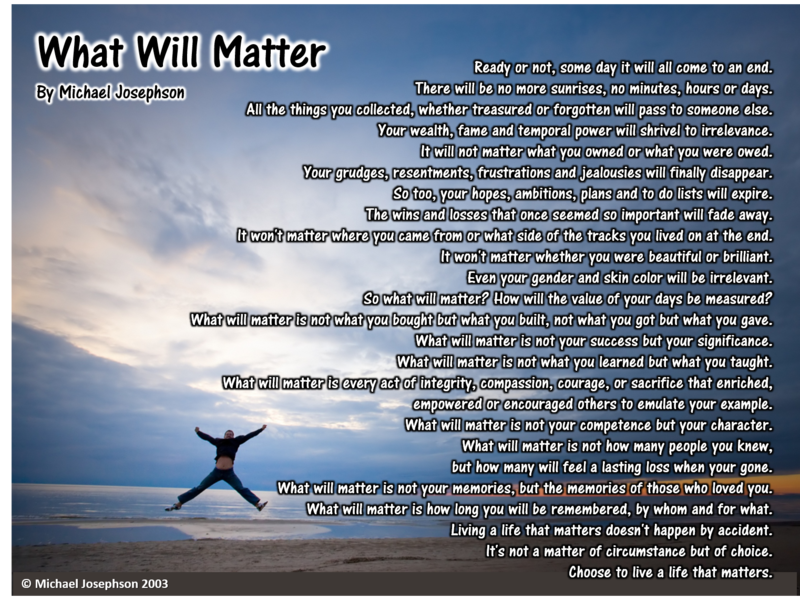 Please check out www.whatwillmatter.com and browse to see other current and archived commentaries, quotes and other good stuff by Michael Josephson.